People make up stories all the time. Bob Dylan made up his own back story by creating an identity his record company would run with. Steve Jobs went out with Dylan’s ex, so he could say he went out with Dylan’s ex. The obvious stories are found in movies, songs, books, but they can be found anywhere. Everywhere. We want details, we want to know how to have a better life, we want to learn. Stories give us that. They have power. It’s not even that hard. Live an interesting life and you can write your own script. Nelson Mandela said we should buy a house 100 metres from where we were born. Or something to that effect. So during the holidays I took the family through my home town of Hawera in the mighty Taranaki. I texted my dad for the address. He told me and I took the photo above. And do you know what? It was a special moment. That was the house I came home to as a baby! My sister was two and I was a snot-ridden crying ball of eyebrow. I thought about knocking on the door but that would have been pathetic. The next day I thought about that house a lot. How it sat beneath Mount Taranaki. How it was surrounded by other lovely homes. How my parents were only 23 and 25. 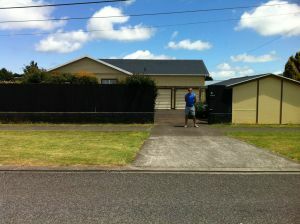 And now I’m back in Auckland and the house I came home to as a baby is a little further than 100 metres away. Road trip anyone?